September 10, 2013 was one of the best nights of my life. Amy has been a big Depeche Mode fan for years. She introduced me to Depeche Mode in high school, when Violator was still popular and everyone knew Enjoy the Silence. Synthpop, or Electronica, or however you classify it wasn’t really my style, but I did think it was pretty cool, and I thought she was pretty cool for liking it. Fast forward to 1993. Amy is in college by now and I’m just about to graduate from high school. Songs of Faith and Devotion is released. Of course Amy got the album, and we listened to it, and I really liked it. We listened to it a lot. We went to see the concert in Chapel Hill (on my motorcycle, but that’s another story). It was an amazing show. I remember the lights more than anything. Fast forward to 2013. Through the years Amy has been a Depeche Mode fan, getting all the albums. She has slowly but steadily influenced my taste in music. For the most part we both like their older stuff better, but I do think Delta Machine is a great album, and I think Amy is coming around to it. (We both think Sounds of the Universe and Exciter are pretty much duds.) Anyway, Delta Machine came out in March so I got her that album for her birthday, and surprised her with concert tickets for Mother’s Day. The concert was … Sept. 10 2013. So, the countdown began. When the big day finally came, which was a Tuesday, we left the kids with Amy’s mom and headed up to D.C. We both love road trips. As much as we both love our kids, it was really nice to have the time together. It was exciting! We listened to Depeche Mode pretty much the whole way up and just talked. We got to the hotel around 2 or 3, and just hung out for a little while before going out for supper and heading to the concert. We had good seats, under the covered section and to the right of the stage. It was a warm night; we were both comfortable in t-shirts. Amy was wearing her Songs of Faith and Devotion concert t-shirt. There was an opening band called ‘Bats for Lashes’ which neither of us had ever heard of, but they were good. Depeche Mode took the stage at around 9pm. 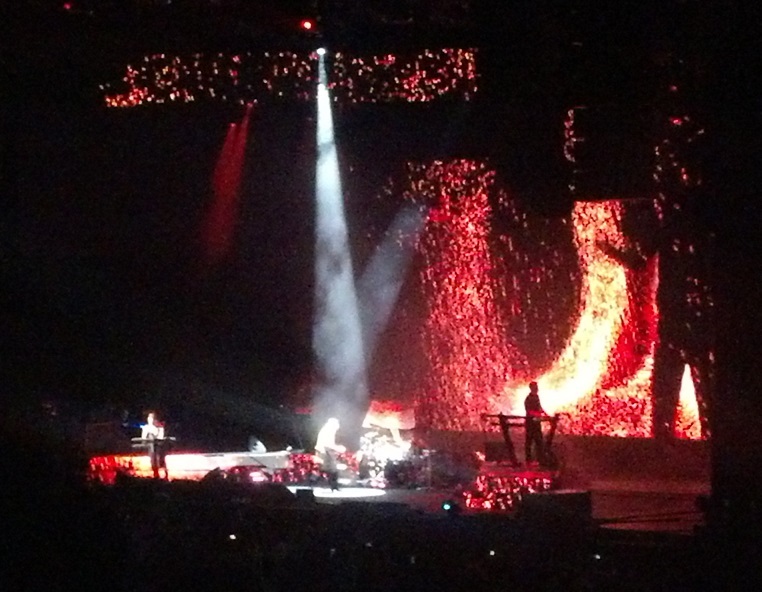 They opened with ‘Welcome to my World’ off the Delta Machine album. It was loud. The light show was amazing. The set list was awesome. There was this feeling in the air that is hard to describe. Amy and I were dancing and acting like kids (and if you know me, that doesn’t happen a lot!). I remember looking over at Amy – she had her hands in the air waving them, and dancing, and singing, and she had this gorgeous smile on her face, and I just wanted to stop time. 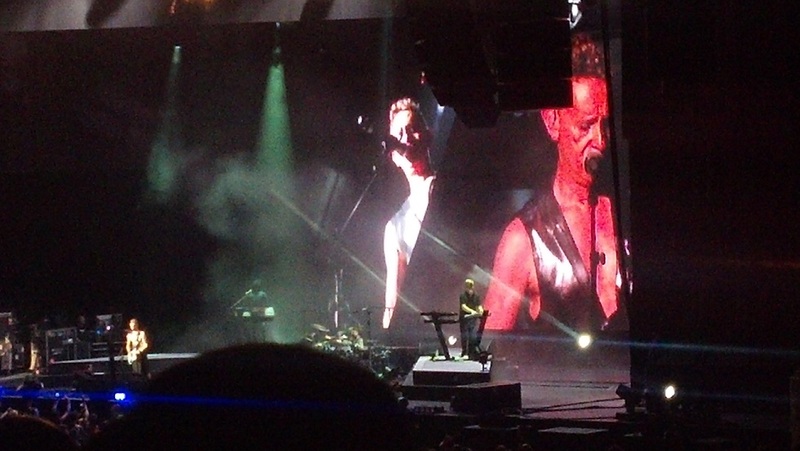 Every four or five songs Martin Gore would sing a song to change up the tempo and give Dave Gahan a break. One of those songs was ‘But Not Tonight’ off the Black Celebration album (one of the older ones). Now, I have to say that some time before the concert we had listened to the song at home. On the album Dave Gahan sings the song. Amy told me it was one of her favorite songs – she loved it. I didn’t think much of it. But, that night, at the concert – Martin sang the song and he changed my opinion of it. He sang it with so much conviction, and it really just captured the feeling of the night perfectly. … and I haven’t felt so alive in years. … my eyes have been so red I’ve been mistaken for dead, but not tonight. I’ll never hear that song again without thinking of that night. It was a special night. I was with the girl of my dreams, the love of my life. We were together, without a care, and I didn’t care about anything else. < Get Your Popcorn Here!